The large size and deep depths of Seneca Lake make it ideal for grape growing. It is no surprise Seneca Lake hosts more wineries than any of the other Finger Lakes. 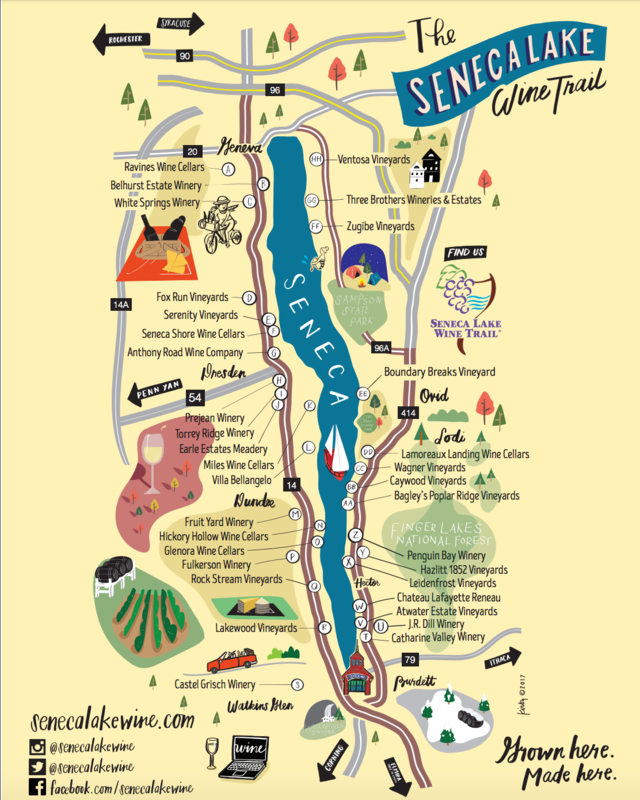 A collection of over 35 wineries on Seneca Lake make up the Seneca Lake Wine Trail. This is the largest and most popular wine trail. 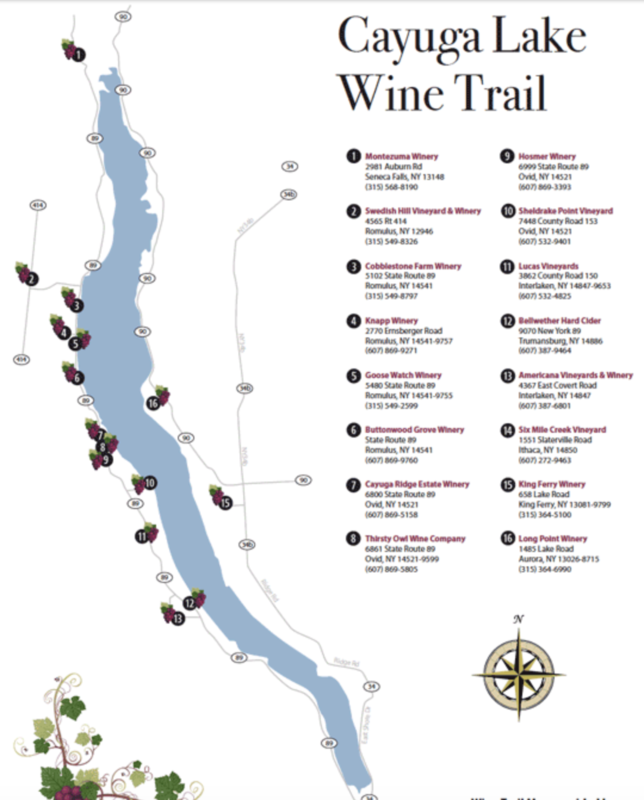 The Cayuga Lake Wine Trail is the most eastern of the Finger Lakes wine trails. There are 16 wineries that make up the trail, each boasting their own unique offerings. Keuka Lake, a Y-shaped lake known as the Lady of the Lakes, was the site of the pioneering of winemaking in the Finger Lakes region and has some extremely scenic and amazing views. The wineries on Keuka Lake afford guests winding scenic drives with views of the lake’s sparkling waters and abundant grapevines which include native varieties as well as European variety grapes. Explore the Keuka Lake Wine Trail year-round and discover the unique beauty the area has to offer while sipping award-winning, local wines. If you visit the Finger Lakes in the fall, you may even get the deliciously amazing experience of smelling grapes fresh off the vine being pressed for harvest! Barnstormer Winery - Barnstormer Winery is one of the newest of the Seneca Lake Wineries. Only in their second vintage, they produced 1,600 cases in 2014. If you want to try some Barnstormer wine, visit the tasting room that hosts live music throughout the year. Billsboro Winery - Focusing on dry vinifera wines, Billsboro Winery uses grapes from the Sawmill Creek Vineyard to make their quality wines. There are two Billsboro Winery tasting rooms, one in Waterloo and the other in Geneva. Castel Grisch Winery - Castel Grisch Winery is a restaurant as well as a winery on the west side of Seneca Lake and offers beautiful scenery of Seneca Lake and the surrounding landscape. Castle Grisch produces a variety of red, white and dessert wines. Earle Estates Meadery - Earle Estates Meadery produces a new twist on wine, honey wine. Dating back to 500 BC honey and water were fermented in to mead, now commonly known as honey wine and is one of the oldest fermented beverages. Try a number of flavors and varieties of this unique taste. Fox Run Vineyards - Fox Run Vineyards focuses on non-hybrid European grapes to make their award winning wines. Using cutting-edge techniques alongside a diligent protection of their vines, Fox Run Vineyards has been producing top-quality wines for over 25 years and offers a top notch educational estate tours. Fulkerson Winery - The Fulkerson family has owned the land on which the winery sits since Caleb Fulkerson first claimed the land in 1805. However, grapes only played a minor role on the farm until the 1970's when Sayre and Roger (5th & 6th generation Fulkerson) expanded grape production. Today, Fulkerson Winery grows a large variety of grapes and produces a number of wines. Glenora Wine Cellars - After the Farm Winery Act of 1976 was passed, the owners of Glenora Wine Cellars took the opportunity to become the first winery on Seneca Lake. Quickly, Glenora Wine became known for its quality, winning several awards in its first vintage. Hermann J. Wiemer Vineyard - Hermann J. Wiemer was convinced vinifera varietals could survive the harsh winters of New York during a time when few others agreed. In 1976, he planted his first vines knowing that the deep depths of Seneca Lake and the surrounding microclimate would protect his crop. Now, the Hermann J. Wiemer Vineyard produces red, white, sparkling and dessert wines and is held in high praise by a number of wine critics. Heron Hill on Seneca Lake - Heron Hill has three tasting locations, one on Keuka Lake, one on Canadiauga Lake at Bristol, and another in Himrod on Seneca Lake. This winery has grown from a small production of 5,000 cases when it first opened in 1977 to producing around 18,000 cases today. Heron Hill also holds a number of special events at all of their tasting locations. Lacey Magruder Winery - Located just west of Seneca Lake, the Lacey Magruder Winery offers wine for your enjoyment. The Lacey Magruder Winery is a piece of Ireland in the Finger Lakes; their tasting room is inspired by a pub in Dublin, Ireland and is named after the owners' two Irish grandmothers. Lakewood Vineyards - In 1951, Frank Stamp moved into Lakewood Farm and converted it from a run-down peach and apple farm into a vineyard. The Stamp family focused exclusively on growing grapes until 1988 when Frank's son, Monty, produced the first vintage under the Lakewood Vineyards name. They have gone on to produce a number of award-winning wines while continuing to grow over 80 acres of grape vines. Lake Street Station Winery - Offering their Lake Street Station Winery wine as well as Hazlett 1852, and 3 Brothers winery wine, Lake Street Station Winery is themed after a 1922 Texaco gas station. Lake Street Station Winery is located in downtown Geneva and features a liquor store as well as a tasting room, café and gift shop. Miles Wine Cellars - Miles Wine Cellars produces estate grown wines that you can sample in the 200-year-old Greek Revival home that serves as their tasting room. You can also host your wedding at Miles Wine Cellars or enjoy their events, the café or stay at the comfortable and quaint Inn. PreJean Winery - Enjoy premium estate grown wines in our air-conditioned tasting room overlooking beautiful Seneca Lake. Picnic on our deck or grounds. Appointments required for all limousines and motor coaches. Shaw Vineyard - Shaw Vineyard is a boutique winery focusing on food friendly European wines. Shaw Vineyards have won awards for the various wines they produce including Riesling, Chardonnay, Pinot Noir, Cabernet Sauvignon and Cabernet Franc. Starkey's Lookout - Starkey's Lookout produces wine using two labels, SenecaHayes Wine Cellars and the Twisted Screw Wine Company. SenecaHayes produces dry wines while the Twisted Screw Wine Company is for sweeter table wines. Starkey's Lookout also produces its own craft beer and soda. Torrey Ridge Winery - Enjoy the beautiful and spacious tasting room at Torrey Ridge Winery & Earle Estates Meadery and sample any of their top quality wines and honey wines. Villa Bellangelo (http://www.bellangelo.com)– Villa Bellangelo is home to the oldest vineyard in Yates County, planted by Dr. Byron Spence in 1866. Michael Missick and the rest of the Missick family continued this tradition after founding Villa Bellangelo in 2002. They use a combination of American and European winemaking techniques to produce a blend that is uniquely their own. White Springs Winery - Visit White Springs Winery any time of year and sample a number of white and red wines in their spacious tasting room. In the milder months, you can enjoy the covered patio and the scenery of Seneca Lake. If it's a little chilly outside, warm up by the fireplace and sip on a White Springs Winery wine. Atwater Estate Vineyards - Boasting one of the most panoramic views of all the wineries on Seneca Lake, Atwater Estate Vineyards has been growing grapes since Ted Marks purchased the vineyard in September of 2000. Atwater Estate Vineyards produces 7,000 cases of wine a year and grows 16 varieties of grapes. Chateau LaFayette Reneau - Using traditional European winemaking techniques, Chateau LaFayette Reneau has won a number of awards for their wine; they have won the Governor's Cup award three times since 1998, the most recent of which was in 2014. Hazlitt 1852 - In 1852, the first of six generations of Hazlitt farmed the land Hazlitt 1852 sits on today. In 1985, Jerry and Elaine Hazlitt founded the Hazlitt 1852 vineyard. Hazlitt 1852 produces a wide variety of grapes and wines and is sure to have something for all tastes. Idol Ridge Winery - Although Idol Ridge Winery is a newcomer to Seneca Lake, the Martin family, who owns Idol Ridge Winery, has plenty of experience with wine; the Martin family also owns the Montezuma Winery and Hidden Marsh Distillery. Idol Ridge Winery focuses on producing wines using European vinifera grapes. Our group tasting fee is $7 per person and includes a souvenir wine glass. We accept reservations daily up until 3 pm. J.R. Dill Winery - Winemaking started out as a hobby for J.R. Dill and it quickly grew into a passion. Continuing the tradition from his great-grandfather, who worked in a vineyard over 100 years ago, J.R. Dill uses his passion for wine and the Finger Lakes to create quality wines. Lamoreaux Landing Wine Cellars - Using sustainability farming practices, Lamoreaux Landing Wine Cellars produces all of the grapes used in their wine. Lamoreaux Landing Wine Cellars uses the consistency and high quality of their own grapes to their advantage, consistently producing award-winning Finger Lakes wines. Penguin Bay Winery - Focusing on cool climate wines, Penguin Bay Winery has won awards for both red and white wines. You can also taste wines from Swedish Hill and Goose Watch, the sister wineries of Penguin Bay, at Penguin Bay Winery. While at Penguin Bay Winery, be sure to visit the gift shop and enjoy the picnic area overlooking Seneca Lake. Three Brothers Wineries & Estates - Three Brothers Wineries & Estates consists of four wineries and a brewery all rolled into one. There are four different areas to enjoy any of the Three Brothers Winery products including a wonderful variety of Finger Lakes wines and craft beers. Located in Geneva on the east side of Seneca Lake, you won't want to miss a stop. Whether you are feeling adventurous, romantic, or sophisticated, there is a special location on the Estate to cater to your needs. Ventosa Vineyards - Try the variety of wines Ventosa Vineyards produces, including their unique Italian varieties like Sangiovese and white Tocai Friulano, in their Tuscan-themed scenic tasting room overlooking the east side of Seneca Lake. You can also enjoy light Italian Cuisine at Café Toscana. If you're looking for the perfect place for your wedding, look no further than the La Vista e Bella Room. La Vista e Bella Room is a large, unique space with a dance floor and access to an expansive outdoor terrace. Wagner Vineyards & Wagner Valley Brewing Co - Cultivating 250 acres of grapes and producing 50,000 cases of wine each year, Wagner Vineyards & Wagner Valley Brewing Co is one of the larger operations in the Finger Lakes region. Wagner Vineyards & Wagner Valley Brewing Co also produces a diverse selection of award-winning craft beers. Both wines and beers can be sampled while dining at The Ginny Lee Cafe, an on-site café on the Wagner Vineyards & Wagner Valley Brewing Co.
Zugibe Vineyards - Specializing in dry and semi-dry Finger Lakes wines, Zugibe Vineyards produces estate-grown wine in Geneva. Winemaker Fredrick T. Zugibe III works to produce innovative, complex, and delicious wines while Sean Zugibe manages the 40 acres of vineyard, growing 11 varietals of grape. You will find a true taste of Americana at this vineyard and café in Interlaken. When you visit Americana Vineyards you can sample a number of Finger Lakes wines, try one of the 20 varieties of homemade fudge or stay for a meal at the Crystal Lake Café. Specializing in small batches, Bet the Farm Winery & Gourmet Market only produces 4-5 varietals per year. Bet the Farm isn't all about the wine, however; you can purchase a number of quality snacks, cheeses, condiments and confections as well. David and Melissa Pittard took over Buttonwood Grove Winery in 2014 from previous owners, Ken and Diane Riemer. David and Melissa look to continue the great reputation the Riemer's created for Buttonwood and are using their experience to create a variety of wines under the Buttonwood Grove Winery label. Jim and Carol Doolittle were New York State Government workers for 11 years, helping to pass the farm-winery bill during their time in Albany. When they were finished with government work they came to Cayuga Lake to start up their own winery. Starting out small they only produced 400 cases in 1982, their first year producing wine. Since then they have grown but have made an effort to stay small, producing 2000-3000 cases of wine a year. Striving to be unique, Goose Watch Winery produces a number of wines that are not ordinarily found in Finger Lakes Wine Country. Viognier, Pinot Grigio and Aromella are just a few of the varietals produced at Goose Watch Winery. Cameron and Maren Hosmer established Hosmer Winery in 1985 and were among the pioneers in the blossoming industry. The tasting room offers a relaxed atmosphere where the Hosmer family and staff strive to make your visit pleasurable and informative. 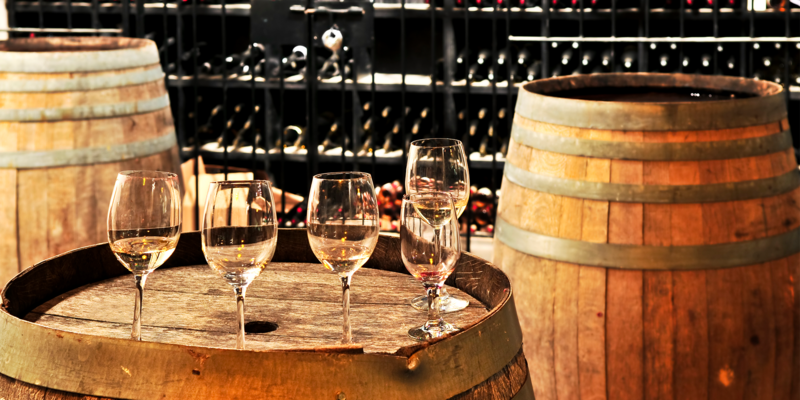 We offer a variety of wines for all tastes, including vibrant varietals and artful blends. Established in 1984 and purchased by its current owners in 2000, Knapp Winery was the first winery to include a restaurant on Cayuga Lake. Knapp Winery sits on 65 acres of land, 40 of which is cultivated to grow 12 types of grapes. In 1974 the Lucas family moved to Interlaken and harvested their first crop of grapes in 1978. They were not content, however, with selling their grapes to other wineries. So, in 1980 they produced their first vintage in a batch of fewer than 500 cases. Ever since the Lucas Vineyards name has continued to grow and produce high-quality wines. Adjacent to the scenic Montezuma Wildlife Refuge, The Montezuma Winery produces over 30 wines as well as a number of spirits. It all started with honey wines, or mead, however. After all, the owners were beekeepers for 30 years. They have since moved on to produce high-quality fruit and grape wines in addition to mead. In the mid-1980s Sheldrake Point turned from an orchard and dairy farm to a vineyard and winery. Using exclusively grapes grown on their own 44-acre vineyard, Sheldrake Point Winery produces distinctive estate wines. Swedish Hill Vineyard is a family run business in its 3rd generation, producing its first 1,200 cases of wine in 1985. The Peterson Family built a tradition of success at Swedish Hill, winning 68 gold medals for 21 wines in 2014 alone. The Thirsty Owl Wine Company sits on 150 acres of land with over 2,000 feet of lakefront property on Cayuga Lake. The Thirsty Owl Wine Company opened its doors in 2002, producing around 1,200 cases of wine. Thirsty Owl Wine Company has since grown over 1000% and has won a number of prestigious awards. Offering all the beauty of the Finger Lakes with a Spanish Flair, Toro Run Winery planted its first 15,000 vines in 2009. Producing its first batch of wine in 2012, Toro Run wine can be found at their tasting room in Ovid or at a number of restaurants and liquor stores throughout the Finger Lakes. Focusing on small batches, Peter and Tacie Saltonstall create award winning wines by creating a top-tier product without sacrificing the quality of their wine in the name of mass production. Overlooking Cayuga Lake and the Varick vineyards, the Varick Winery tasting room is located in Romulus about halfway up the west side of the lake. Varick Winery & Vineyard also has a cherry orchard and produces fruit jellies that can also be purchased in their tasting room. 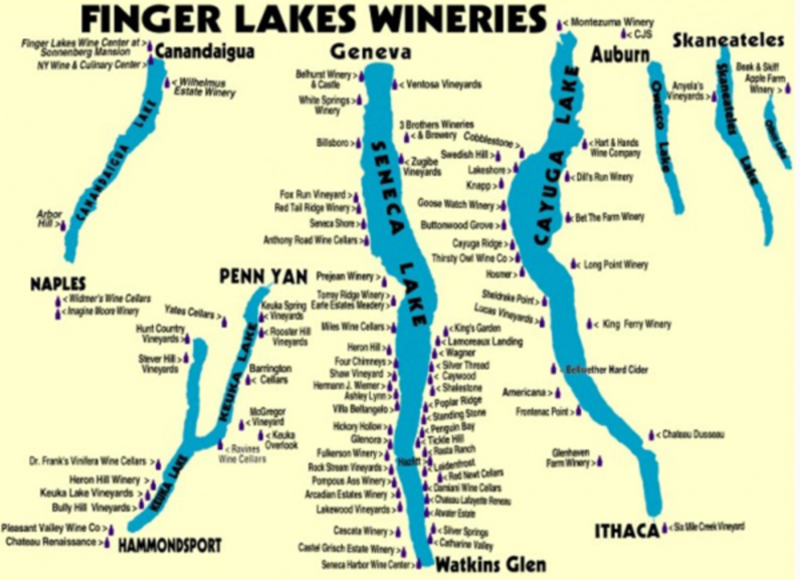 A Finger Lakes Winery, Barrington Cellars, is a small family owned and operated winery located 500 feet from the eastern shores of beautiful Keuka Lake, the central Finger Lake. Since 1971 Ken and Eileen have been growing grapes and perfecting their wine making technique to bring the joy of quality Labrusca (native), French-Hybrid, and Vinifera wines made from grapes grown in our own vineyards. Owned and operated by Patrice Demay benefits from over 400 years of wine making. We have the secrets and experience passed from generation to generation! All of our wines are unique and in a class by themselves. We offer a large selection of reds, whites and fruit wine made with real fruit! We use grapes grown here in New York State for our wines. Chateau Renaissance specializes in making award winning New York State Champagne. Ukrainian Dr. Konstantin Frank was a pioneer in grape growing in the Finger Lakes region, discovering early growing techniques that were crucial for European wine grapes to survive in the Finger Lakes region as well as adaptations to counter the cold growing conditions for vines in the Finger Lakes. Quickly earning a reputation for their Rieslings, Dr. Konstantin Frank has won international awards for several of their wines. These wines and more are available for tasting year-round and all tastings are complimentary and free of charge! The 170 acres Hunt Country Vineyards sits on along the West side of Keuka Lake on has been home to the Hunt family for seven generations. Hunt Country Vineyards is the oldest, continuous producer of genuine ice wine in the United States and has had their wine served at the United Nations, ordered by the White House, featured in Food and Wine Magazine and on NBC’s Today Show. Located on a slate hill overlooking Keuka Lake, Heron Hill Winery’s Greco-Roman winery exterior is impressive from the roadside with stunning views of Keuka Lake and the grapevines in front of the property. You can sample these wines and more in their tasting room that was named one of the 10 most spectacular tasting rooms in the world by Travel & Leisure Magazine. Their signature heron can often be found flying somewhere close by while guests sip on their award winning wines. Producing a number of red and white wines, Keuka Spring Vineyards boasts one of the best selections of wines in the Finger Lakes and boasts the distinguished award of being the Winery of the Year in 2016. Located three miles south of Penn Yan, you can picnic or shop for regional gifts at the gift shop while you're at Keuka Spring Vineyards. McGregor Vineyard was one of the first to prove the more delicate vinifera grapes could be grown in the Finger Lakes region in spite of the cold winters. Since opening the vineyard in 1971 and their winery in 1980, McGregor Vineyard has produced a variety of wine but is best known for their Black Russian Red wine. Holding the designation U.S. Bonded Winery No.1, the Pleasant Valley Wine Company produces a wide variety of white, red, sparkling and dessert wines. The Pleasant Valley Wine Company, located just outside of downtown Hammondsport on the south end of Keuka Lake, is also home to the famous Great Western Winery Visitors Center with is rich with Finger Lakes wine history. Our tasting room in the little hamlet of Keuka Village overlooks the bluff of Keuka Lake. Knowledgable staff will guide you through tasting beautiful wines as you take in the breath taking views. Trained in France, Ravines’ Owner/Winemaker, Morten Hallgren is known for producing terroir-driven, dry and mineral-tinged wines. Dry Riesling (3 times on Wine Spectator’s Top 100 List), expressive red wines & hand-riddled sparkling wines are amongst the region’s finest. Also visit our location in Geneva on Seneca Lake. After leaving their careers in Southern California, Amy and David Hoffman came to Keuka Lake to plant the Savina Estate Vineyard in 2002, yielding its first winemaking fruit in 2004. Amy and David have created Rooster Hill winery, quite literally nestled among the vines on the east side of Keuka Lake, with the winery’s interior ambience bringing a taste of Tuscany to the area. Adam Foltz is a fifth generation grape grower but he didn't find his passion for winemaking until he found himself in Texas, thanks to his service in the Air Force, where he met a couple who owned a small winery. Foltz started created a plan for his own winery in 2010, putting the plan to action and tells the familiar story guests to the region will discover that a hardworking man had a plan, planted a vineyard, crushed and sorted grapes year over year to prove that hard work really does make amazing wine. Stop in to the tasting room to learn all the best grape growing practices, from a family that knows it well, can share while you sip on their tasty wines. Born in Zell Mosel, Germany, Winemaker Hans Peter Weis traveled to the United States on a quest to pursue his passion and discover the world. However, his travels were cut short when he stumbled upon his home away from home in the Finger Lakes region of New York. Terroir is the name of the game in this particular winery’s circumstance. What is terroir? A set of environmental factors that add up to a wine’s smell and taste. Finding the minerality of the soil and climate similar to that of home in Germany, Peter is able to pursue his passion of handcrafting traditional German style wines for Finger Lakes locals and guests alike to enjoy!